"Curse of Ra Moon" Part Four: The startling, jaw-dropping conclusion to this MEGA-EPIC story is here! 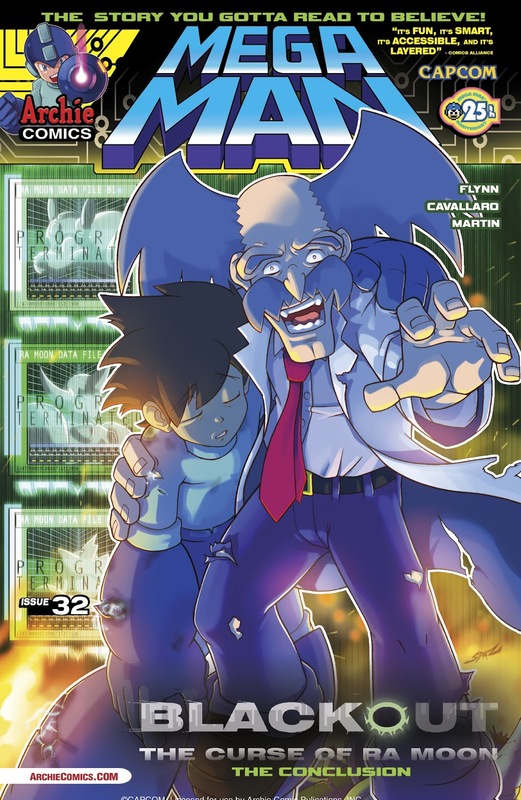 The tables have turned as the evil Dr. Wily and his sixteen Robot Masters stand shoulder-to-shoulder with Mega Man! But the ominous alien known as RA MOON still threatens the lives of both the heroes AND the villains! Who will survive and what will become of them? Can their combined power overcome Ra Moon? One thing is certain—there's no way our hero will be walking away from this one unscathed! Featuring an all-new cover art from Mega-art-guru Patrick "SPAZ" Spaziante and an awesome new "payback" variant cover from artist POWREE (Sandra and Woo)! Alas, we won't be reading this one until December. Until then, do enjoy the cover art. You can check out the variant cover at Destructoid. It's quite nifty, if I do say so myself. The inclusion of Centaurman in the normal cover intrigues me. Calling it right now. Ra Moon's remains coagulate into Ra Thor. Who will serve as Archie's evil rival for the original arcs, until Bass is invented. I wonder if they plan on introducing Zero at some point in the future, because why not? Doubtful. Unless they do a Megaman X comic, the best they can do is a cameo in a Power Fighter story arc. And that wouldn't happen until after the MM8 arc. Oh, wait. "SCRIPT: Ian Flynn". Now, I am not a mind-reader. But I suspect that part of the reason you haven't yet gone to Bumbleking and taken your complaints directly to Ian is because it's much safer to take pot-shots at him here. Is it REALLY about "improving the quality of the comic" if all you're doing is being a disruptive jerk on a site than Ian likely doesn't visit? Actually, what Flynn doesn't read is derogatory or critical messages. See, he and his fans share a common philosophy: "Ignorance is bliss". So how can he see if a comment is derogatory or critical without reading them? You just making a excuse after another. I have seen Ian reply to criticism on Bumbleking, which is where you should be going if you want him to listen to you. To name a specific example, over in the "Mecha Sally" thread, people were complaining about how the arc dragged on too long and didn't seem to actually accomplish much (or at least, Mecha Sally herself was a bit disappointing). Ian acknowledged this and said he'll be sticking to shorter arcs that get the point across more easily, while still having an overarching larger plot in the long run.